Aloha! Welcome to my website...I hope you Enjoy my Art! Here I am painting 'Rabbit Island'. See the finished painting to the right. Kailua, looking toward the Ko'olau mountains. 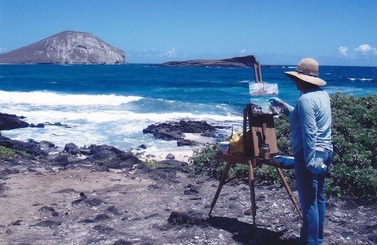 ﻿Born and raised in Hawaii, I love the colors and the excitement of painting outdoors! I feel so blessed to grow up in Hawaii AND in the best town on Oahu, Kailua! 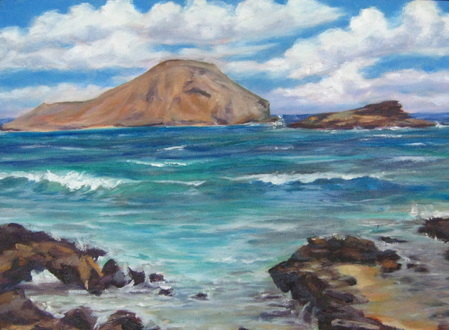 I graduated at Kailua High School and attended the University of Hawaii; earning a Bachelor of Fine Arts degree. After graduating at the UH, I opened some retail stores with family (Splash! Hawaii and Little People Hawaii) and spent 32 years as a store owner and retailer. It was in Kailua, that my husband and I raised our 5 kids; they are all adults now, on their own and prospering (proud and thanking God!). In 2009, I started painting again...mostly as a 'weekend painter', but I enjoyed every minute of it!! In May of 2013, I sold my last two stores (Yay! ), and began a new phase of my life...a new adventure! In 2014, I moved to Northern California to start my 'great adventure'! Painting NEW scenes with a new color palette and having fun discovering!! I love my first time experiencing the Seasons...my favorite are Spring and Fall! So blessed and grateful to be able to travel and paint! Italy in 2015 & 2016 and San Miguel de Allende in 2016 and 2017! Thank you to the many teachers I have had: Mark Brown, Patrick Ching, Ed Furuike, Nancy MacDonald, Trisha Adams, Randy Sexton, Richard Robinson, Kristen Olson, Janet Jones and many more! !